and takes the ultimate gamble! and the chef asserts control. As the end of the year draws closer and weather draws ever colder it's nice to forget the outside world for a little bit. 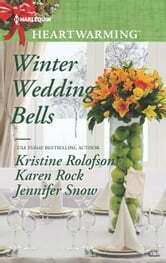 Winter Wedding Bells allows that. I received an ARC of this wonderful anthology in exchange for an honest review. Romantic fiction is my genre of choice and this read falls into that category. The Kiss by Karen Rock, The Wish by Kristin Rolofson and The Promise by Jennifer Snow bring Christmas cheer, sweet romance, and a breathtaking sense of wonder to the holiday season. Whether giving love a second chance with the one you can't forget, falling (literally) into the arms of love when you least expect or making a major decision that could leave behind regret. Full of stories that are a pleasure to read.